As mentioned before, previous experience and genetics determine how human handling is perceived by an animal. When a person enters the edge of the "flight zone", the animal will move away. The size of the flight zone varies depending on how much contact pigs have had with humans. 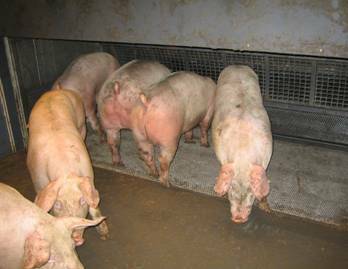 Groups of pigs in a chute will often move forward without prodding when the handler walks in the opposite direction past the point of balance at the shoulder of each animal. This diagram shows the optimal behaviour of the handler in order to move pigs forward in a single-file chute. The path with the arrows is the handler's path. Diagram: Temple Grandin. Generally it best to handle pigs in groups, especially when driving them to stunning. The flow of animals is based on their following behaviour and handling of single animals will produce a "stop-go" effect that is not only stressful to the animals but also will increase the need for driving tools and greater human contact. The pig's poor vision at ground level is one reason for its preference for gradually exploring new situations. This makes pigs slow to move. Ensuring that the ground level is well lit allows the pigs to move faster, and with less hesitation. This photograph shows pigs in a group handling system that allows them time to investigate the stunning box before they enter it. Photo: Sophie Atkinson.